- The headmaster of a school in Nepal to John Wood, forever changing his life. I can’t get over how similar to Three Cups of Tea this book is. Both are ‘Guy goes on vacation in the Himalayas and decides to help’ stories. But while Greg Mortenson jumped into the helping without knowing anything about how to run a business (and subsequently got into all kinds of trouble), John Wood is first and foremost a businessman. In 1998, John Wood was a rising executive at Microsoft when he took a vacation that changed his life. 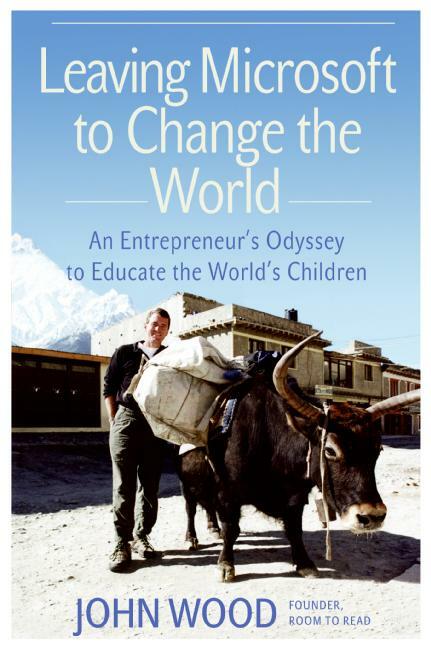 What started as a trekking holiday in Nepal became a spiritual journey and then a mission: to change the world one book and one child at a time by setting up libraries in the developing world. He was soon driven to leave his career with only a loose vision of the change he wanted to bring to the world. Leaving Microsoft to Change the World is interesting and mildly entertaining but not particularly well written. Wood clearly thinks very highly of himself (and fairly so), which sometimes makes his prose feel preachy and moralizing. Most chapters end with neatly packaged lessons, good lessons, but sometimes oversimplified to make them tie up neatly. At times this book almost reads as a how-to-start-your-own-charity manual. And perhaps that’s how Leaving Microsoft to Change the World should be read. It is a very business savvy book. Wood explains the lessons he learned from working for Microsoft and how he applied them to his non-profit work. On the more positive side, Wood is clearly very passionate about his job and vision. I’ve never made Microsoft executive kind of money, so I can’t exactly empathize with the stress of quitting such a job…but obviously it’s a big deal. If you’ve ever considered leaving your job and doing something good for the world instead, this book will definitely inspire you. If you want a sneak preview, you can download chapter 1 here (PDF). Go here to learn more about Room to Read. Watch a video of John Wood talking about delivering books in Nepal.